Stephen Dawson rescued a late point for Barnsley to keep the pressure on Ipswich boss Paul Jewell. The visitors looked to be on their way to a first win in six games when Aaron Cresswell fired in a free-kick which Barnsley goalkeeper Ben Alnwick should have kept out. Barnsley pushed hard for an equaliser and saw striker Chris Dagnall fire against the inside of the post. But they did level late on when Dawson thumped in an exquisite volley. Ipswich remain in the bottom three of the Championship table and a section of the travelling Town support unveiled a 'Jewell Out' banner at Oakwell. Jewell did see his side take an early lead when Adam Drury laid a free-kick off to Cresswell and he fired in a 20-yard free-kick that Alnwick failed to stop. Lee Martin could have doubled the lead but fired over from a good position before Barnsley striker Craig Davies dragged his shot wide after a neat passing move. Dagnall then found some space and fired in a low effort that hit the inside of the post before the home side did find a way through. A sweeping move found Jacob Mellis and he sent a fine ball over for Dawson, who finished with a volley with the outside of his boot. Barnsley assistant manager David Flitcroft: "I thought the referee lost control early on and gave daft free-kicks. "I thought the free-kick that they scored from wasn't a free-kick but I was disappointed at the way we defended it. "I thought [goalkeeper] Ben Alnwick could have done better with it and he's held his hands up. "He knows he made a mistake, but he stuck at his task and will be a better player for it. The rest of the players helped him and dug him out of a hole." 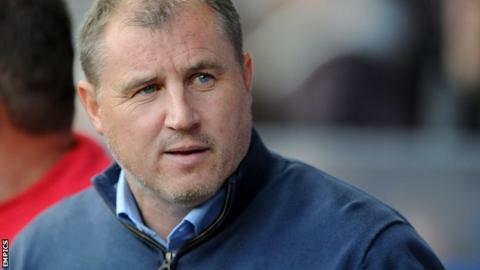 Ipswich manager Paul Jewell: "We've lost three games on the bounce and last week Barnsley beat Birmingham 5-0 so to come away from here with a point is fantastic. "We stifled and frustrated them but we didn't have the quality to get the second goal."